Laugh - Cry - Think! 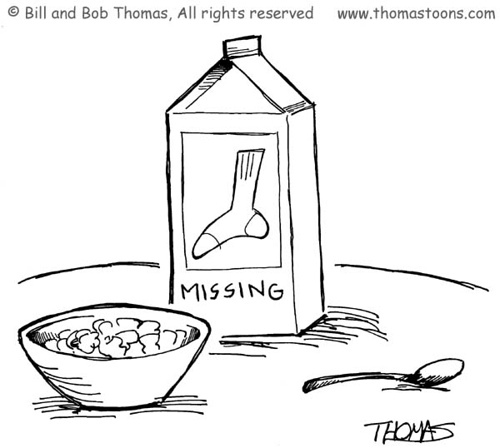 : Where on earth do all the missing socks go? 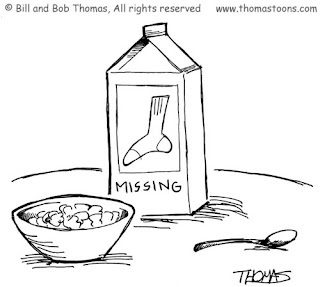 Where on earth do all the missing socks go? Many of you probably have some socks lying around that no longer have a partner. Today’s sad reality is that one in 10 socks have a falling out and cannot reconcile their differences. Being trodden on by your stinking feet all day is a high-pressure job and it often negatively affects a sock’s family life. This pressure can lead them to decide to go their separate ways—usually one sock will remain behind while the other sock seeks a new life elsewhere. During the spin cycle of your washing load, a sock can edge its way up and over the top of the machine. As it is flying at such a great speed, the molecules that make up the sock are in a “frenzied” state, meaning it can literally travel through a wall. If you ran fast enough at a wall, you too would travel through it—though only try this in hospital emergency wards. Once outside, socks—like leeches—catch lifts on anything that moves past, from dogs to snails. Another way of escape is from a washing basket. Socks will work their way to the top or a crack in the basket and, when near an open door or ducted heating vent, make a jump for it. Also, if socks are drying near a heater, they can become “hot air socks” and float away. You might have noticed socks falling on the ground from your clothes horse. That’s an unsuccessful attempt at a flight to freedom. One other way in which socks try to escape is creeping down your foot and, when completely off the end of your foot, making a jump from your shoe. This all brings an important issue to light. If you notice a sock that creeps down your foot, drops off a clothes horse or falls out of a clothes basket, take this as a signal that this pair of socks needs counselling. Perhaps you can save their pairing. Fact: Socks were first worn with sandals after languages were confused at the Tower of Babel. This is an indication that fashion was also confused at the time.